To dress them up a little, I divided my glaze into two portions and added a bit of food color to each. While the cookies are still warm, you paint the glaze on with a pastry brush – or if you don't have a pastry brush, a basting brush or clean paint brush will do. The glaze sets firm so the cookies can be stacked in storage. 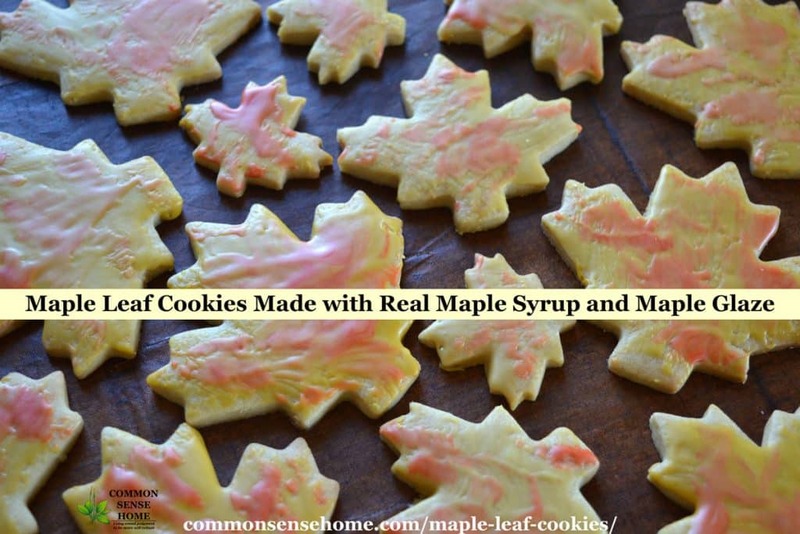 You can also skip the glaze entirely, but I think it brings out more maple flavor in the cookies. 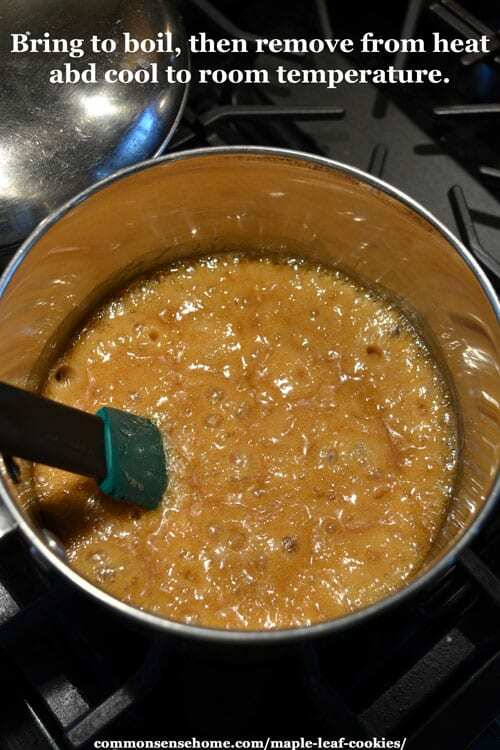 In a medium saucepan, combine butter, sugar and maple syrup. Bring to a boil and then remove from heat. Cool to room temperature. While butter mix is cooling, measure flour, ginger, cinnamon, salt and baking soda into a mixing bowl. Stir milk into cooled butter mixture, and add to dry ingredients. Mix until well blended. Dough will be soft. Divide dough into two disks, wrap or place in closed container and chill for 2-4 hours. Roll out the dough on a lightly floured surface or parchment paper, working with half at a time. Dust top with flour if needed to prevent sticking. Roll 3/16″ to 1/4″ thick. (Aim for an even thickness for all cookies on one baking sheet.) 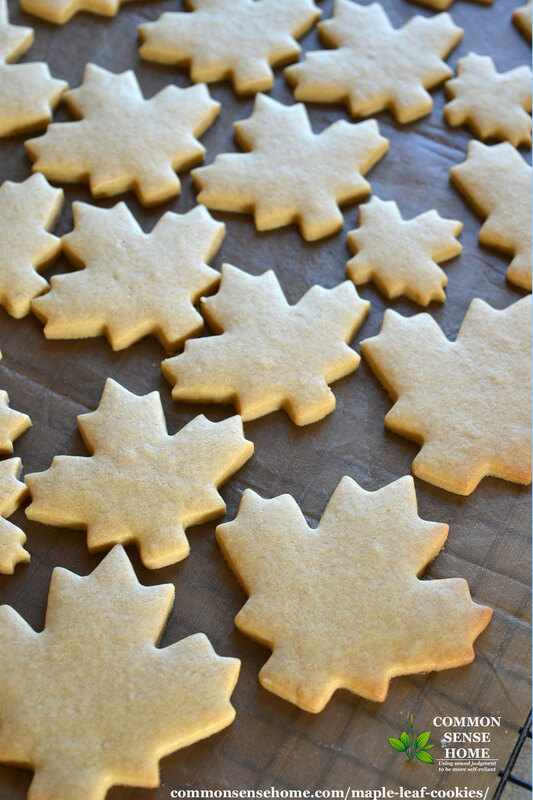 Cut with a maple leaf shaped cookie cutter. 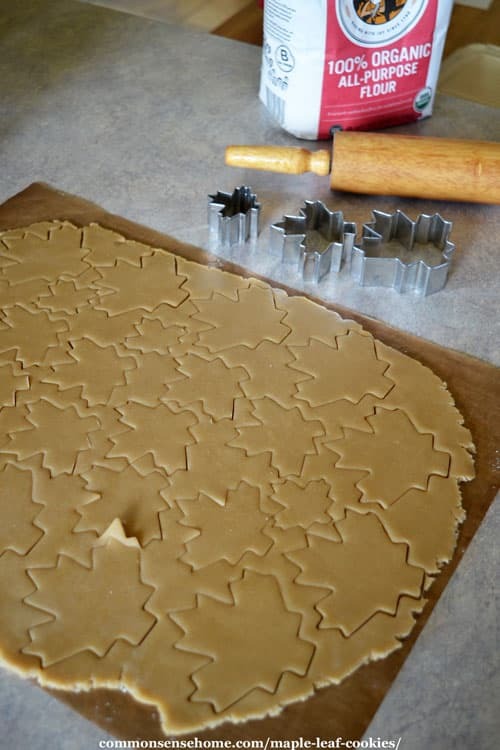 Place cookies on an ungreased cookie sheet. (I use my Airbake pans covered in reusable parchment paper.) Bake at 375°F for 8-10 minutes, until gold brown. Transfer to cooling rack covered in wax paper. 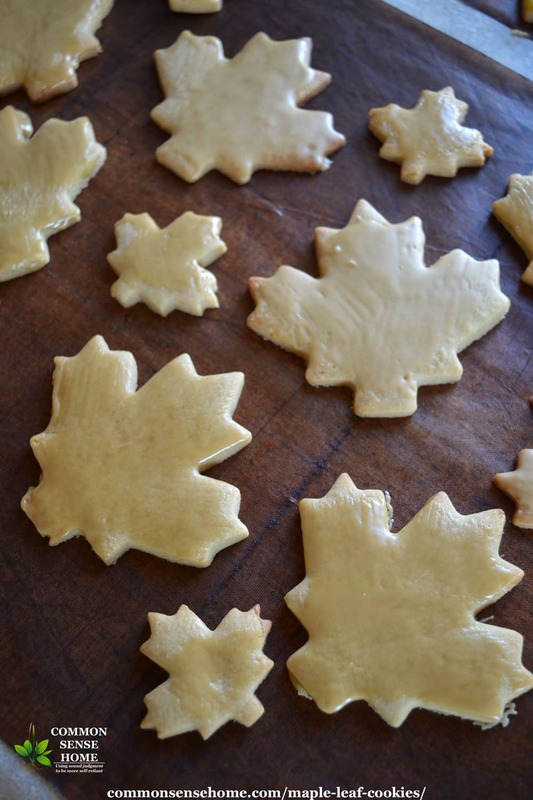 While cookies are baking, prepare maple glaze by combining powdered sugar and maple syrup in a small bowl. Brush on cookies while still warm. 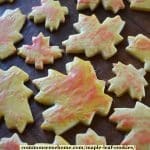 If desired, you can divide the glaze in half before using and tint half yellow and half red, then dapple the colors over the leaf cookies. Allow cookies to cool completely before storing in an airtight container. 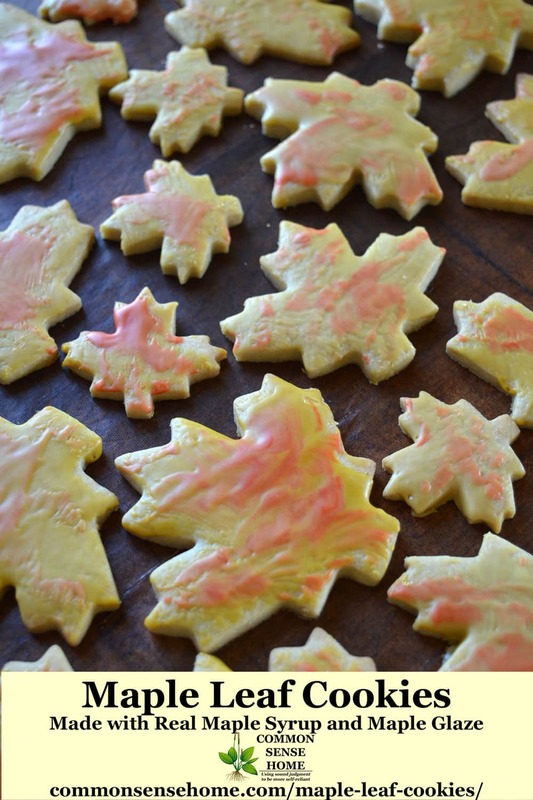 These light, crisp cookies with a touch of real maple syrup are fun for holidays but easy enough for an anytime treat. 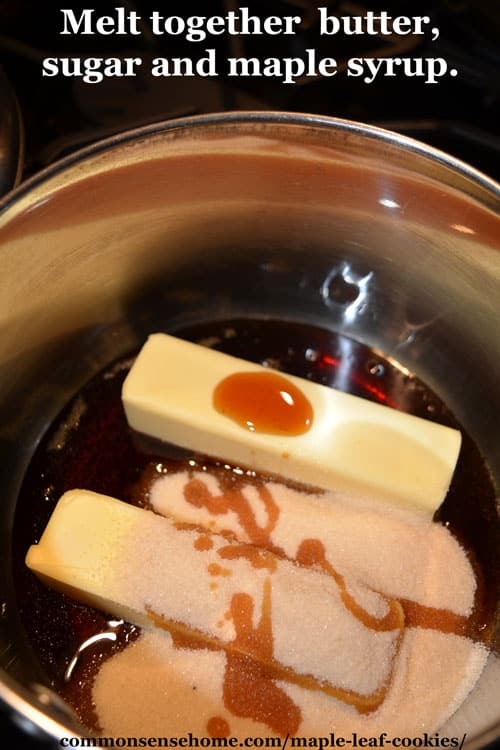 In a medium saucepan, combine butter, sugar and maple syrup. Bring to a boil and then remove from heat. Cool to room temperature. Originally posted in 2107, updated in 2018. Could I substitute the maple syrup for honey, and if so, would the directions change in any way ? 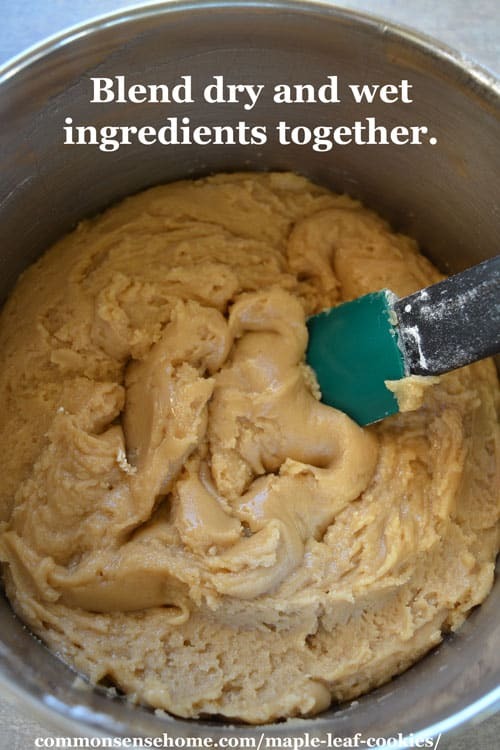 Also, can I just mix the batter by hand instead of using a mixer ? Thank you very much for your help and God bless you. Honey tastes sweeter than maple syrup and tends to finish a little more sticky. The only way to know for sure how well it works is to give it a try. I’m sure the results would be edible as is, but the amount of flour and liquid might end up being tweaked a bit. I mix almost everything by hand. It’s quieter. In the photos, I dumped the dry ingredients into the wet ingredient pot instead of vice versa. I’m guessing that shot might look like the inside of a mixing bowl, but I did indeed mix by hand.